One of my favorite Brunello producers for years has been Il Poggione, located just below the town of Sant' Angelo in Colle. 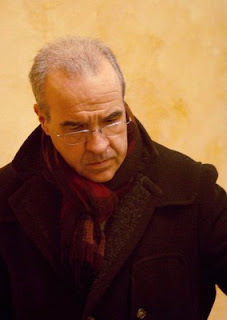 Owned by Leopoldo Franceschi, the wines are beautifully made by Fabrizio Bindocci, a strict traditionalist. He ages his Brunello only in large casks (botti grandi); a few years ago he switched coopers and now uses French oak rather than Slavonian. Bindocci and his son Alessandro hosted several journalists including myself for a wonderful vertical tasting at the winery this past February. Not only was it a rare opportunity to try several vintages of this great Brunello at once, it was also a chance to taste what Brunello was like more than 40 years ago. As Brunello has become a collector’s item, many new estates have sprouted up over the past 10-15 years. When the Il Poggione wine was made in 1966, there were only 26 producers of Brunello; today there are over 150. The local wine scene has certainly changed, but the outstanding quality of Il Poggione has not! So much goes into making a great wine. Certainly having great material in the vineyards helps; Fabrizio Bindocci mentioned that as the local weather has been getting slightly warmer over the past few years, they have been planting new clones specifically created to work better at higher temperatures. But perhaps the principal reason the Il Poggione team succeeds so brilliantly is their humility along with a constant belief that they can always improve the quality of their products. "I never think I make the best wine," Bindocci told me. "That way I can make better and better wine every year." The wine industry of Campania is largely based on ancient varieties; modern methods of production are used, of course, but it is these grapes, first planted some 2000 years ago by Greek colonists, that are the foundation of this region’s visiticulture. Some producers today use small French oak and/or harvest their grapes late in order to produce a riper, more deeply extracted style of wine. This, no doubt, an effort to make their wines seem relevant to a worldwide audience used to such offerings. Thankfully, some of Campania’s producers have resisted this approach, none more so than Mastroberardino, keeper of the flame of Campania’s wine heritage. My recent visit in May to the winery and new estate vineyards strengthened this message for me, not that it needed any reinforcement. Mastroberardino is the classic winery of the Avellino province where three wines – two white, Greco di Tufo and Fiano di Avellino and one red, Taurasi – are the most famously recognized and heralded wines of the region. While a few dozen other estates make these wines, only a few offer the consistent excellence Mastroberardino displays each vintage. Certainly almost no other producer has their track record. That’s fitting, as it was this family that arguably rescued these varieties from extinction. At the end of the Second World War, the area’s vineyards were in shambles, a result of Italy’s war economy. Antonio Mastroberardino, who was in charge of everyday operations at the winery throughout much of the latter part of the 20th century, worked with his father to preserve the ancient varieties at that time by taking the few cuttings that were left and propogated them, planting new selections in the area. Thanks to this work, Greco, Fiano, Aglianico (the primary red variety of Taurasi) and other varieties were saved, according to Piero Mastroberardino, Antonio’s son and today, president of the winery. “It was due to his great work that we can still drink these noble ancient wines from indigenous varieties,” he remarks. Today, Mastroberardino continues to be one of the estates everyone looks to for these classic Campanian wines. Modern technology has entered the picture, but not at the expense of tradition. “We have maintained our traditions,” Antonio Mastroberardino told me a few years ago at the winery. During my recent trip, I tasted the new releases at the winery in Atripalda and stayed at the company’s beautiful estate called Radici Resort in the small village of Mirabella Eclano, about a 20 minute drive from the winery. This resort is less than two years old and is open to the public; they can reserve a room or simply dine at the beautifully appointed Morabianca restaurant, which features excellent regional cuisine as well as an impressive wine list. There is even a nine-hole golf course, which winds its way through Aglianico and Falanghina vineyards (I managed to get in a quick round with Piero one morning). This estate is one of the important vineyard holdings of Mastroberardino, as their special Taurasi bottling called Naturalis Historia is produced from older vines here, while their new cru bottling of Falanghina called Morabianca is made from an impressively sited vineyard behind the Aglianico. Mastroberardino has decided to work in greater depth with Falanghina and the results show in the new 2008 Morabianca bottling, which offers lovely aromatics of quince, pear and acacia backed by beautifl texture and acidity. This is a lovely wine with a variety of foods, from local shellfish to risotto with vegetables or braised chicken. This is the winery’s finest selection of Greco grapes; this has excellent depth of fruit and beautiful floral, pear and lime aromatics. The winery made several impressive white wines in 2008 – this is outstanding. Grab some before this limited production wine disappears! This is slightly richer on the palate than the preceding wine with impressive aromas of lemon oil, honey and kiwi. Medium-full, this has a long, rich finish with excellent acidity. This is an Aglianico that has not been aged long enough to be called Taurasi; it is also lighter on the palate. It is an excellent introduction to the bitter chocolate and black cherry flavors of this variety and is delicious now and should drink well for another 2-3 years. At less than $20, this is a very good value. Radici means “roots,” referring to the Campanian heritage that Mastroberardino upholds with their wines. Taurasi is the most celebrated red of the area; this is made with 100% Aglianico and is medium-full with elegant tannins and precise acidity. This is aged in small French oak barrels as well as the large Slavonian casks, but you don’t notice the wood. A bit lighter than 2004, which was a great year, this is a notable example of the style and consistency of the producer. He also emphasized that while he works with ancient varieties, the Campanian wine industry combines the old with the new, as evidenced by the use of the most modern equipment in the cellar as well as recent research of new clones of Greco, Fiano and Falanghina. How nice that Piero Mastroberardino continues to represent the roots of his family’s beliefs about local wines. “We work in the continuity, the roots and history of this terroir.” Nicely said and as you will taste in their new releases, nicely done. One final note that has nothing to do with wine, but as I mentioned golf in this post, I wanted to comment on a wonderful golf event that just ended. At the U.S. Open, the drama was superb as always with things going down to the last hole. So many people wanted Phil Mickelson to win, not only as he's never won this event, but also for the timing, as his wife Amy will be undergoing treatment for breast cancer (Phil, I was pulling for you as well). It's really a tribute to him that he did so well, tying for second, given everything he's gone through with his wife's condition and the fact that he hasn't played much competitive golf as of late. But for me an equally compelling story was that of David Duval. Here's a guy that was number one in the world about ten years ago; over the past eight years (the last time he won a tournament), his game has slipped so badly that he was ranked #882 in the world coming into the U.S. Open. What in the world is a guy like that doing challenging for the championship? Duval actually was tied for the lead as he stood on the tee at the 71st hole, though Lucas Glover birdied the 70th hole to take the lead he would not relinquish. So Duval, who also tied for second (with Mickelson and Ricky Barnes) came up a little short. But what an effort he put forth! He's been quoted as never being a quitter and boy, did he prove that! His story should be a lesson to all of us that no matter how bleak things look, stay with it and things will improve. I know I'll take that out of his week. In a wonderful interview just after he completed his final round, NBC commentator Jimmy Roberts asked Duval if as a sports fan himself, did he appreciate his story? Duval said that people like to identify with people that are down instead of guys like Michael Jordan, Le Bron James and Tiger Woods, who are one in a million. "A lot of us get kicked around a lot," Duval remarked. Amen to that, David! If the guy never does anything else this year on the golf course, his story this week was an inspiration to all of us. Napa's Sequoia Grove winery has a high reputation; many wine-lovers know of its well-regarded line, which includes Chardonnay, Sauvignon Blanc, Merlot, Syrah and Rutherford Bench Reserve Cabernet. Few, on the other hand, have heard of its impressive young wine-taster. 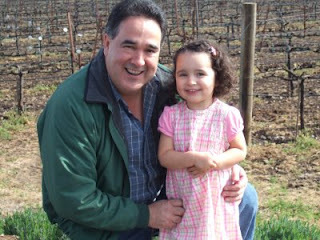 That's Sophia Trujillo, daughter of Mike Trujillo, Sequoia Grove’s winemaker. Sophia is four-and-a-half-years old. Mike was born and raised on his family's ranch in La Jara, Colorado, and he studied architectural engineering in college. During spring break in 1981, he visited a family friend--Jim Allen, owner of Sequoia Grove. "Jim offered to put me up for a few days," Mike recalls. "In return I helped in the vineyard and winery operations." After about a week, Allen offered him a job. "I was 21," he says, "and at that age you have no clue what you want to do, really. But the money was good and the weather was great. so I said yes. My engineering training went into my first job, which was planting the vineyards that are now Domaine Carneros." Before he knew it, wine had "found me." And, in Mike, Jim Allen had found a keeper. 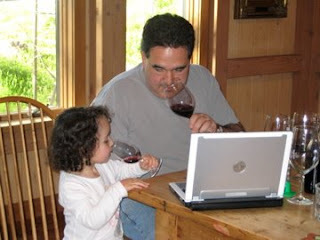 Mike is now Sequoia Grove's president and chief wine-maker--and father of Sophia. "My Uncle Joe always devoted some time to each of his three children individually, and I followed his lead. 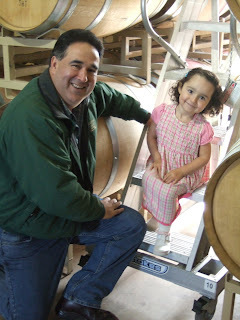 I began taking Sophia with me to the winery once a week, even when she was so young that her mother, Elizabeth, had to pack her into a bassinet along with her bottles and my lunch." Mike's weekly version of Take Your Daughter to Work Day includes bank errands, vineyard visits and even lunch meetings with growers. "She very well restaurant-trained," Mike says, although she will occasionally visit other tables to find out what people are drinking. Then she'll say brightly, "My Daddy makes Cabernet!" Early on, Mike taught her a critical skill. "I was barrel-tasting one day and of course she wanted to do everything Daddy did, so I gave her a sip. It went right down the hatch, and I thought, not going to work. So I spent some time standing over a drain with her, teaching her how to spit. Now she spits like a Frenchman. She spits better than I do!" Sophia has grown into her role as unofficial winery mascot. She likes to greet visitors to the tasting room, saying "Welcome to Sequoia Grove" as she opens the door. And she's a star of the cellar tours Mike leads for members of the trade. "She'll climb up on a barrel, pull the bung out and stick her fingers in for a taste," Mike says. "She'll say 'That's good wine, Daddy,' and when I ask what kind it is, she comes right back with 'Cabernet, Daddy!'" At that point Mike will send her off to the Merlot; Sophia will pull another bung, taste and proclaim it good. "Then I'll ask again what kind of wine it is, and she'll say 'Merlot, Daddy!' At that point, as if on cue, almost everyone on the tour will ask 'She can tell the difference?' And I'll say “Sure--can't you?" Now that Galloni has written his review, I’ve been getting emails from retailers bragging about their price for this wine and of course, they have included Galloni’s review. I understand this, especially in this economy, as retailers are doing what they can to move this wine out of the store and bring in some much-needed cash. But where were these retailers a few years ago? As dozens, if not hundreds of wine writers in Italy and the United States have known for years, Il Poggione has been one of the leading estates in Montalcino for more than four decades; there aren’t many estates that can make that claim. But the way these retailers are pushing this wine, you’d think this was a new producer. One thing that will happen with some of the customers who buy this wine is that they will purchase it because of a review, meaning it could have been any producer, not just Il Poggione. These people are called cherry pickers and are notorious in the business as they buy the top rated wines whenever they can. But where were these people in previous years? Probably buying such wines as Casanova di Neri, a Brunello that has consistently received scores in the upper 90s in The Wine Spectator. If so, this would be highly ironic, as Casanova di Neri produces a very ripe, very modern, international style of Brunello while Il Poggione remains in the traditional approach of winemaking for Brunello. So many customers are buying a wine because it gets a high score, not because they think they’ll like it. I’d like to stay positive, but I’ve been around too long and have seen this before. I hope that the “new” customers of Il Poggione based on Galloni’s review will seek out Il Poggione when the next few vintages are released. So of course do Alessandro Bindocci and hs father Alessandro the winemaker! But let’s see what happens when the 2005 and 2006 are released; as these are two very good – but not great – vintages for Brunello, will the cherry pickers be there to support Il Poggione or will they look for other wines (perhaps not even Brunello) that receive higher scores? Producing wine is a long-term business and love affair; vintners don’t just release wines from great vintages (great is such an overused and misunderstood term), they must release them from virtually every harvest. Readers of my newsletter have known of my love for Il Poggione for years; I rated their bottlings from 2002 and 2003 – two less than stellar years - as excellent. It’s easy for any producer to make a very good wine in a notable vintage such as 2004 (if you can’t, as they say, find another job!). But to me one of the best qualities about a producer such as Il Poggione has been their track record with Brunello. As I wrote earlier, how may estates have been at the top of their game for more than 40 years? So for consumers, retailers or restaurant buyers who might be tempted to purchase a bottle or several of the 2004 Il Poggione Brunello based on Galloni’s review, please do the Bindoccis a favor and buy the wine when the 2005 is released next year – you will not be disappointed! A few final notes: Antonio, congratulations again on getting it right. While no score was published with this review, I can only make an educated guess, but I’m sure the score will be in the mid to high 90s. If so, this is in contrast to James Suckling of The Wine Spectator, who awarded the wine 91 points. Some of you might be saying, “wait, 91 points is pretty good.” Well there’s a big difference between pretty good and stellar. The 91 from Suckling is a shrug on his part, letting us know he admires the wine, but isn’t wild about it. No surprise here, as the Il Poggione Brunello is all about elegance and harmony; it isn’t flashy enough for Suckling’s tastes. So how nice that a major wine publication awards Il Poggione as among the very best of Brunello. But Antonio, two things. First, this mention of this wine “standing alone” among the 2004 Brunellos. While I’m sure that the Bindoccis are pleased, there are a dozen or so examples of 2004 Brunello that are first-rate including Sesta di Sopra, Pian dell’Orino, Talenti, Il Palazzone, Fuligni, Caprili and Uccelliera (read my February post on vinowire here). I want readers to know that there are other estates that made an outstanding 2004 Brunello and have been at the top of the pyramid of producers in Montalcino for several years and that all of these estates including Poggio Antico and Ciacci Piccolomini are to be commended as well for their recent Brunello releases. So, Antonio, I’d rather you didn’t write that one wine stood alone among the 2004 Brunellos. It’s this type of wine writing that gives the business a bad name. It’s as though there has to be a best. Il Poggione is among the very best and has been for years. Let’s celebrate that. But let’s also remember another dozen or so producers that deliver the good every year. Finally, I do have one more bone to pick with Signore Galloni, one that is far more serious than the one I just wrote about. That is in regards to his text about the Il Poggione where he writes that the wine was aged in French oak casks. This is accurate, but why write this? All this does is open up a can of worms. Let me explain. To the average consumer that reads this, French oak aging for a Brunello will probably signify that the wine is made in a modern style. But nothing could be farther from the truth, as Il Poggione is a traditional Brunello producer, through and through. Yes, the oak happens to be French, but the casks are the large ones called botti grandi, which are the traditional ones that have been used to produce Brunello for more than a century; Fabrizio Bindocci made the decision a few years ago to work with new coopers, so his large casks are French oak and not Slavonian. The modernists, who prefer flashiness and ripeness over balance and subtlety, use the small barrels known as barriques (225 liters instead of the botti grandi, which range from 2000 to 6000 liters). 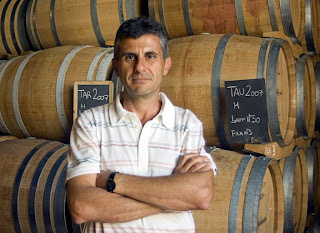 So Antonio, what is important about oak aging with Brunello is not where the wood comes from, but the size of the casks. This is something you need to communicate to your readers; it’s your responsibility to be accurate. 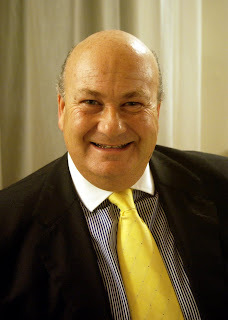 Certainly, Galloni has heard of the scandal in Montalcino, where some producers have been accused of bypassing regulations, by including grapes other than Sangiovese. The big picture here deals with tradition versus doing what some people feel is right for the moment. Given that, it’s so important these days to let people know about traditional producers and how they view their work. Il Poggione is a traditional producer and one of the best. During a recent visit to Chile, I commented to my friend Hector, a native Chilean, that I thought his country has the finest seafood in the world. His comment was that France has better oysters, but otherwise he agreed with me. Now it’s one thing for my Chilean friend to stick up for his homeland, but in this instance, he had a great reason to do so. He explained to me that Chile is the beneficiary of the Humboldt Current, which comes up the Pacific from Antarctica. This is a very cold current, meaning the fish that do reside in waters off the shore are hearty, meaty creatures. A great example is mero, which I tried this for the first time three years ago at a winery restaurant in the Casablanca Valley. My host, Pablo Morandé, asked me if I had ever tasted it and when I told him I had not, he explained to me that this was the real Chilean seabass. He noted that many restaurants in Santiago and other cities in Chile serve seabass that was caught just off the coast; this is good, but not great seafood. Mero, however, resides more than 10 miles off the coast in colder, deeper waters and is much meatier. He was absolutely right, as this was an incredibly rich, full-flavored, tender piece of fish that melted in my mouth like butter. You don’t see Mero on many menus in America, but if you do, go for it, or else pay a visit to Chile for this remarkable dish. (By the way, any reports you may have heard about Chilean seabass – and some of that in America is actually from Alaska – does not refer to mero. This is not on any endangered list, nor is it being overfished). 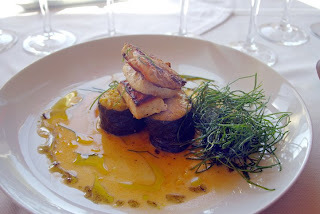 On my trip in April, there were two great seafood meals I enjoyed. One was in the northern part of the country in the Limarí Valley, where I enjoyed a special type of shrimp known as camarones de orilla. 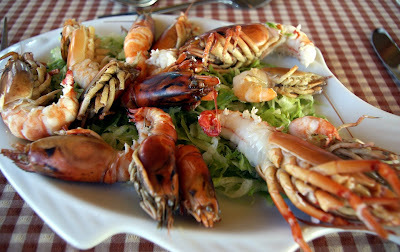 These are river shrimp and are caught in the shallow rivers of the area and are often served at meals the same day. If you drive the main highway out of La Serena, you will see vendors waving these shrimp at cars passing by, selling the seafood they have just caught. We didn’t have time to stop and buy any from a local, but we did enjoy them – steamed – at a Hacienda Santa Cristina, a wonderful restaurant in the area. Also at the outstanding Tanino restaurant located at the Casas del Bosque winery, my friend and I sampled two wonderful seafood dishes. He went for grilled mero with spaghetti, sauteed in arugula pesto and toasted almonds, while I opted for cannelloni stuffed with Chilean abalone and shrimp with a sauce of Chardonnay and Grana Padano cheese (like many Chilean restaurants, there is a major Italian influence in the cooking here at Tanino). Both were first-rate and great examples of the quality and flavor of Chilean seafood as well as the creativity of Chilean cuisine. I highly recommend Tanino when you visit the Casablanca Valley; this area has some of the finest restaurants in the country and this is one of the very best. 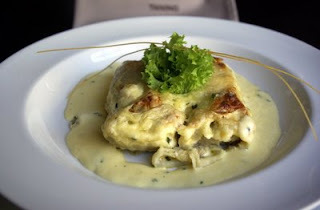 As for the wines to accompany the various seafoods of Chile, my preferred choice is Chilean Sauvignon Blanc. For years, this was a category that was rather mundane (the use of plant material was the big drawback), but with the introduction of clones from France and California over the past ten years, the Sauvignon Blancs of Chile have become something of a revelation. Now that the vintners are seeking out cool climates such as Casablanca and Leyda Valleys for the variety, the wines display more complex aromatics along with lively acidity and the structure to age for as much as 3-5 years from the finest vintages. Take the 2008 Sauvignon Blancs from Carmen or the Santa Rita Reserve, both from Casablanca Valley. Both wines offer beautiful spearmint and melon fruit with subtle grassy notes and have very good acidity. The 2008 Medalla Real bottling from Santa Rita is from Leyda, where the estate vineyards are only five miles from the ocean. This has more intensity in the nose (notes of pear and green pepper highlight the aromas) and slightly higher levels of acidity. Other very good to excellent examples from Casablanca include the 2008 Viña Casas del Bosque and the 2008 Morandé Reserva. What makes these wines even more attractive are the prices; all these wines can be found for $16 or less. There are two special Chilean Sauvignon Blancs I want to mention as well, as these are among the very best I’ve had from the country. 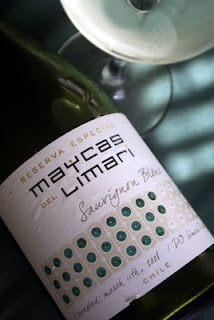 First is the Maycas Sauvignon Blanc from the Limarí Valley, which I tasted for the first time on my recent trip when I enjoyed the river shrimp I mentioned earlier. Maycas is a realtively new project of Concha y Toro and based merely on this one wine (there are also bottlings of Maycas Chardonnay, Cabernet Sauvignon and Syrah, all from Limarí), I’d say this is a great project. 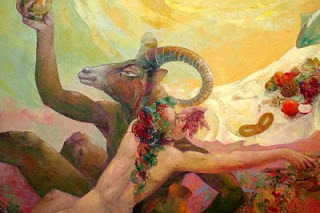 I tasted the 2007 that day and was blown away by the wine’s aromatics and intensity. From the first smell and sip, you realize you’re dealing with a serious Sauvignon Blanc; the wine offers deeply concentrated aromas of fennel, asparagus and green pepper along with ripe melon and grapefruit- it’s an amazing set of perfumes. Medium-full, the wine has great depth of fruit and striking acidity. 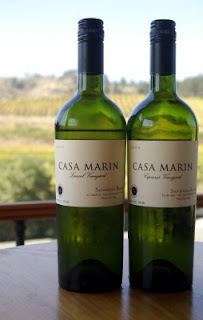 One other estate I want to focus on regarding Sauvignon Blanc is Casa Marin, owned by Maria Luz Marin, a dynamic woman who has spent many years working with other wines estates in Chile before establishing her own. Her estate is in the San Antonio Valley, a small sub-zone of Leyda; located extremely close to the ocean – one of Marin’s vineyards, Cipresses, is less than two miles from the Pacific; this is a razor’s edge climate. Some thought Marin was a bit crazy to try and plant vineyards so close to the coast, but she has proven these doubters wrong. She is producing lovely bottlings of Pinot Noir, Syrah (espcially elegant and supple), Riesling and Gewurztraminer, but her best wines year in and year out continue to be her two single vineyard offerings of Sauvignon Blanc, Cipresses and Laurel. The former, as it is from a vineyard closer to the sea, has more herbal, bell pepper and gooseberry notes, while the Laurel is a bit more tame, if you will, with flavors of lime and grapefruit to accompany the peppery notes. The 2008s are out now and they are outstanding wines with vibrant acidity and the structure to age for 3-5 years. These are priced higher than most examples of Chilean Sauvignon Blanc – around $30-$35 a bottle – but they are outstanding examples of how great this country’s white wines have become! P.S. One other note on the Maycas and that has to do with the labels, which are some of the most creative I’ve ever seen. Maycas is a word from the language of the Quecha people meaning “ariable lands”; the Quecha were the foundation of the Inca Empire, one of South America’s most powerful civilizations. Along with having a beautiful font design, the label is a recreation of a calendar used by the Quecha in which a 10-day week known as a Junka was used as a measure of time. The label features drawings of turquoise counting stones that mark the length of time from grape harvest to final bottling. Neat concept!